I generally don’t keep much food in my pantry, simply because I don’t have much storage space. But I always have on hand a few cans of assorted tomatoes, a few onions, garlic, and a box of no boil lasagna noodles. If you’ve never used the no boil noodles, try them! Assembling the lasagna used to be a bit of a chore, what with dealing with the sauce and boiling the noodles, but lasagna now resides on my list of quick and easy meals. Do the prep work over the weekend, and you can enjoy a hearty homemade dinner any night of the week. Round out the meal with a crisp salad and perhaps a glass of wine, and you’ll be dining well. I made this particular recipe in a smaller pan because I’m not cooking for a family, I’m just cooking for me. This recipe will still feed a family, and you may still get some leftovers, depending on how large your family is and how hungry you are. I like to portion out some of the leftovers into small containers destined for the freezer, for those nights I simply don’t have the energy to cook. 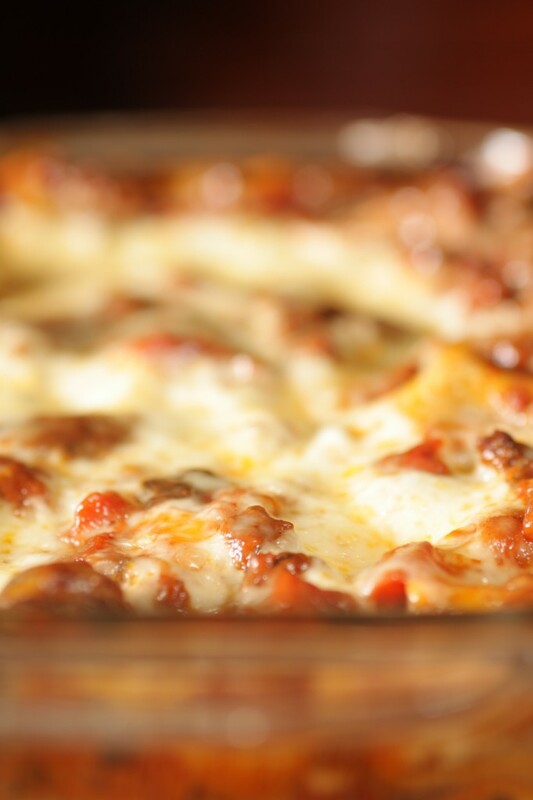 I think lasagna is one of the few pasta dishes that actually freezes well. Heat the oil in a large skillet over medium high heat. Add the onion and sauté until softened, about five minutes. Sprinkle salt and pepper on the beef. Spread the onion to the edges of the pan and add the beef. Brown each side, then break up the meat to further brown. Add the garlic and cook until fragrant, about a minute. Deglaze the pan with the wine. Add the tomatoes and tomato paste, stir to combine. Add the bay leaf and thyme and simmer on medium-low heat for 30 minutes. Taste and correct seasoning. Remove the bay leaf and thyme and discard. Add the parsley and cook for five minutes. Remove from heat. Spray a 7×11 baking dish with cooking spray. Spoon a small amount of meat sauce in the baking dish to just cover the bottom. Top with 3 lasagna sheets, breaking up the sheets as needed to fit the pan. 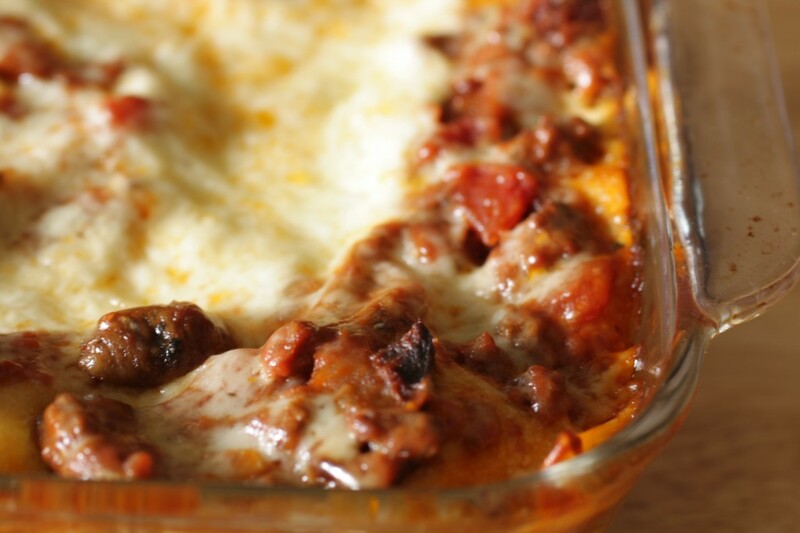 Top with a layer of meat sauce and a sprinkle of mozzarella cheese. Top with the remaining layer of noodles, the rest of the meat sauce, and the rest of the cheese. If not baking immediately, cover with plastic wrap and refrigerate up to two days. Heat oven to 375*F. Remove plastic wrap and cover the baking dish with foil. Bake for 30 (50 if the lasagna was refrigerated) minutes, then remove foil and bake until cheese is melted and golden around the edges. Let stand for five minutes before cutting and serving. mmm…cheesy, saucy goodness. bonus–the leftovers are just as good! this is an excellent and highly adaptable meal. Tomato paste and no water in this recipe.???? Is that correct.??? Hi, I’m Sara’s mom replying on behalf of Sara who passed away. I have personally made this recipe and use the juice from the canned tomatoes. As a matter of course, when using tomato paste, I do add just a little water to rinse the can. Other than that, I don’t add additional water. However, if you feel the consistency is too dry, I would start with adding 1/2 cup of water and gradually add more until you are pleased with the results.